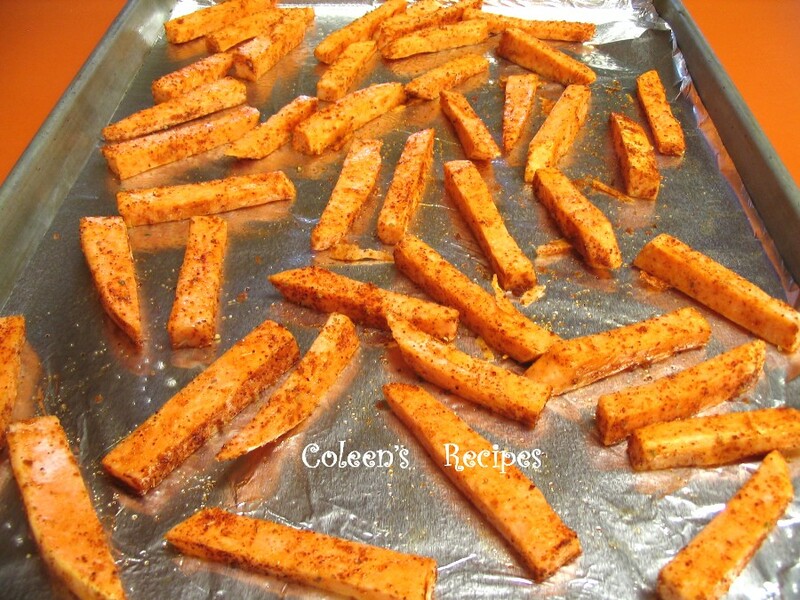 Oh my goodness, these baked sweet potato fries are tasty AND low calorie!! Even my picky picky husband said they were good THREE TIMES during dinner. Now that is a record!! comfort notes. Crisp or not, I could easily eat a big bowl of these and not feel guilty at all....now THAT is saying something. OK, a word about yams/sweet potatoes. Don't ask me which is which. I always buy the one with the deep orange flesh, so I'm calling them sweet potatoes in this post. 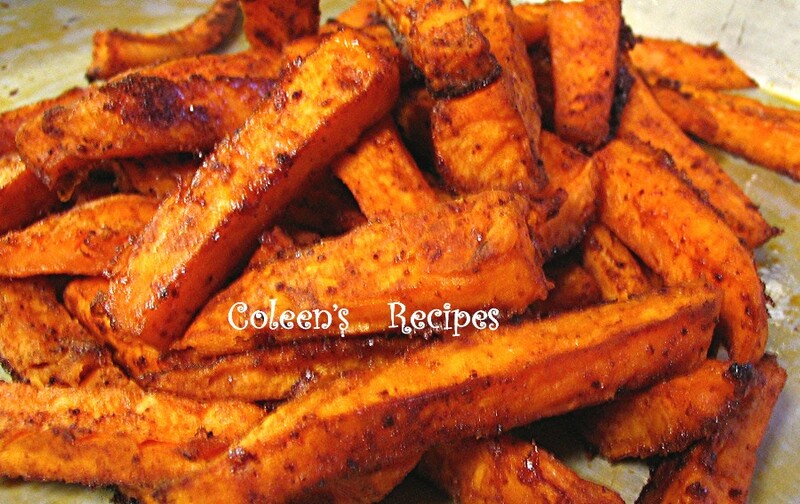 Peel the sweet potatoes and cut them into French fries. Soak in water for one hour (important), then drain and pat them dry. Put the potatoes in a bowl and sprinkle with one tablespoon vegetable oil, toss around, making sure the oil coats everything. In a small bowl, mix the cornstarch, garlic powder, onion powder, chili powder, smoked paprika, salt and brown sugar together until very well mixed. 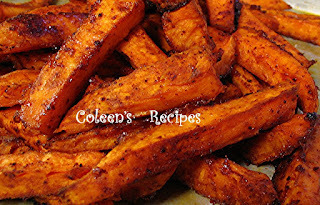 Sprinkle HALF of this mixture over the oiled potatoes and toss well. Sprinkle the last half of the mixture over the potatoes and toss well, making sure everything is coated. Spread the potatoes out onto a lightly sprayed cookie sheet (I don't spray my cookie sheet. 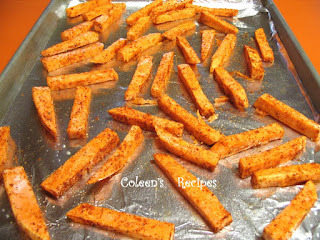 Instead I line it with Reynolds non-stick foil (it works perfectly in this recipe) just make sure you spread the fries out so they don't touch each other (use two cookie sheets if necessary). Bake in PRE-HEATED 400°F oven for 15 minutes. After 15 minutes, flip the potatoes over and bake another 15 minutes. Depending on how hot your oven runs, you might have to add a couple more minutes to get those crusty edges. Remove from heat. They aren't the prettiest fries ever, but they are delicious (hubby likes to salt his after they come out of the oven, but personally, I think they don't need it). Note: If you like a little more spice, you can use chipotle chili powder in place of the regular chili powder + smoked paprika.